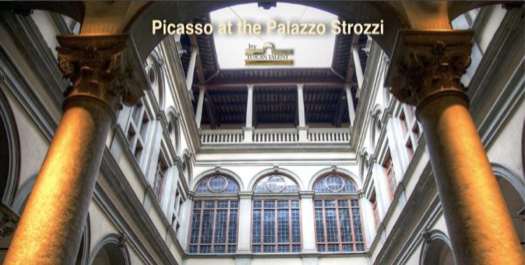 The Palazzo Strozzi in Florence has organized another feast for devotees of modern art with a major new exhibition entitled, Picasso and Spanish Modernity. Curated by Eugenio Carmona and organised by the Fondazione Palazzo Strozzi and Museo Nacional Centro de Arte Reina Sofía in Madrid, this exhibition has already attracted thousands of visitors, eager to see the works of one the most dominant and influential artists of the 20th century, Pablo Picasso (1881 – 1973). The Fondazione Strozzi believes that great art should be accessible to all and on top of its excellent education programme is offering a family/children friendly experience. In a bid to initiate new and exciting ways of experiencing art, the Strozzi has set up dedicated interactive rooms, which are full of unconventional ideas and activities and family labels to further stimulate and encourage conversation about the works on show. There are also free drawing kits, which can be collected at the information desk. It is worth noting that travelling by public transport can earn you a reduction in the ticket price and a family ticket enables families to visit the exhibition multiple times. There are 9 rooms displaying around 90 works created by Picasso and fellow 20th century Spanish artists during the years 1910 – 1963, mostly paintings but also sculpture, drawings and engravings. 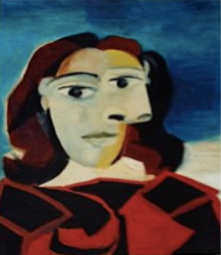 They give a fascinating insight into Picasso’s influence on Spanish art relating not only to such well-known figures as Joan Miró and Salvador Dali, but also to lesser known artists of that time like Maria Blanchard and Rafael Barradas. 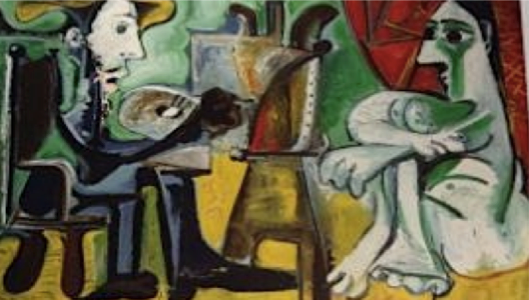 One of the recurring themes first seen in Section 1 is Picasso’s view of the psychological and symbolic relationship between the artist and his model. His many lovers inspired countless paintings, sketches and sculptures and there are two other versions of ‘The Painter and the Model’ on display, one in the middle and one at the end. We are given several reminders of the devastating consequence of war and politics during this period. No artist of any genre could remain untouched by these events and some of the first items on display are sketches and engravings showing Picasso’s interest in the relationship between the bull and the horse. These ideas were later used to inspire the content of his famous masterpiece, Guernica in which he makes a powerful political statement after the devastating bombing by Nazis of the Basque town of Guernica during the Spanish Civil War. The variations room looks at how he brings together a diversity of styles such as cubism and expressionism into one painting, leaving behind traditional stylistic unity. As with a musical theme and variations, he begins with an idea or figure and develops and embellishes it by working on different styles at the same time. This diversity of styles became a major feature of his works. 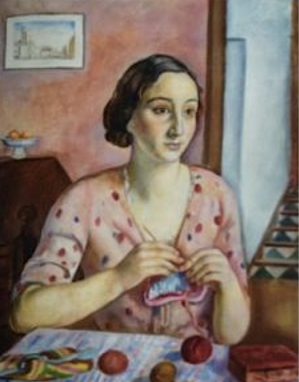 His famous portrait of one of his many muses, Dora Maar stands out in this section. The Ideas and Form room covers a period of 40 years from 1910 and illustrates the influence on art of social and political developments of the time, looking at works ranging from Cubism to Concrete Form. 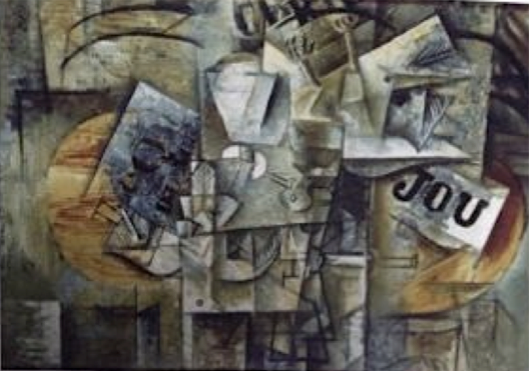 Cubism was born out of a close collaboration between Picasso and Georges Braque. It revolutionized the arts world in general and was the first major radical innovation to appear in modern art. 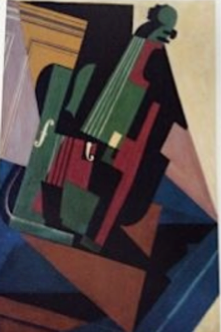 One of the mediums of Cubism is collage and while Picasso and Braque were masters of this art form, it was interesting to see works by contemporary artists like Juan Gris. He was a Cubist and saw a strong relationship between the painter and the architect in terms of structure, using different dimensions and angles. 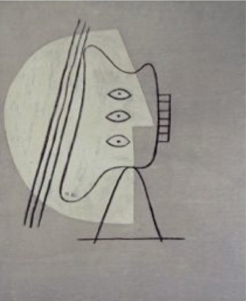 The section on sensitivity and lyricism demonstrates the desire of Picasso’s contemporary Spanish artists to combine modern art with a communication of similar feelings to those triggered by poetry or music, but without delving into sentimentality. The influence of poetry on the artist and sculptor can be seen in some dream like paintings by Joan Miró and impressive sculptures by Julio González made from wrought iron. Picasso himself had strong links with other art forms, being a friend of composer, Erik Satie and painting scenery for the Ballet Russes, along side composers like Stravinsky and choreographer, Diaghilev. The Nature and Culture section looks at the interaction between nature and art. 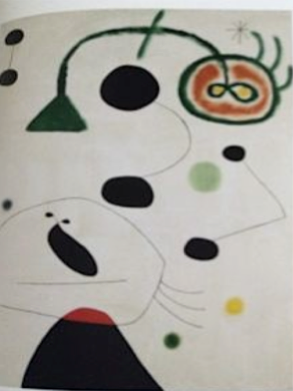 The surrealist artist, Joan Miró painted Figure and Bird in the Night in 1945, revealing a personal shift in focus to the subjects of women, birds, and the moon. This section leads naturally into the room on Reality and Super-Reality where reality moves towards Surrealism, seen in Picasso’s engravings and sketches and Dali’s sketch for the invisible Man. Joaquim Sunyer, was a member of the Spanish Noucentisme movement who aimed at realism, but in a mysterious and dreamlike way. In this eye - catching portrait, a young woman working on a mundane task stares dreamily into space, giving a feeling of moving to a distant land, beyond reality. This sculpture, There is a way for the Spanish People that Leads to a Star (1937) by Alberto Sánchez is beautifully crafted. The exhibition does not include the painting Guernica, but sections 6 and 7,Towards Guernica: the Monster and the Tragedy are devoted to its development and construction, with a collection of engravings, paintings and preparatory drawings, never before put together in such numbers. The Minotaur is commonly known as Picasso’s alter ego, and he identified the mythical creature with the artist, even connecting it with bull-fighting and creating an ironic figure of a female matador. Picasso later used these ideas when asked to create a large painting during the Spanish Civil War. As he mourned the bombing of the ancient Basque town, he created many images illustrating his devastation. 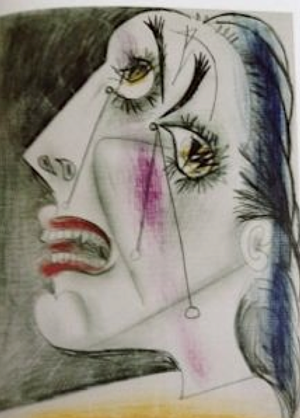 The tragedy of Guernica can be seen in this portrait of the weeping woman, her mouth twisted in grief, her eyes displaying bombers as they hover over their prey. The exhibition runs until 25th January 2015.